We do our best to accommodate the interests of students and faculty. Our courses carry one, two, or three semester hours of credit, based on 45 hours of classroom and course excursion contact time for three credits. There will, of course, be homework, reading and assignments outside these hours. All undergraduate students must register for 6 to 9 credits. All classes have no more than 14, so students have close contact with their professors. As an introduction to Modern Greek, this course provides students with the fundamentals of grammar, syntax, oral expression, listening comprehension, reading, and composition. Students develop the skills and vocabulary necessary to read simple texts and hold basic conversations. Students explore Modern Greek culture, history, and society, through the language. Teaching materials include current newspaper articles, literary passages, songs, and various linguistic games. Athens has always been a city in transition, a museum of Greek history as well as an active, living entity. It retains the traces of the political, economic, religious, and cultural history of Greece—in its streets, its buildings, its glorious artifacts and ruins—even as it struggles to move forward. 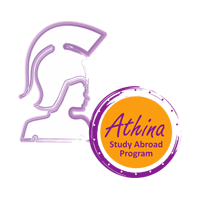 The course will explore Athens as a city through the centuries, from the rise and fall of the state city during the ancient years and will focus on the years after Athens became the capital of Greece in 1834. The course will include visit to the Herodium ancient theatre and to the ancient Agora, the commercial, political and religious centre of the ancient city. It will also include visits to neoclassical Athenean buildings of the 19th and 20th century, such as the impressive Zappeion Mansion (1874-1888), the Presidential Mansion (1897) the old parliament and the Benaki Museum. Students will become familiar with the European Union history and policies. They will investigate how to do business both within Europe and with Europe from the US. Students will become aware of the cultural challenges of cross-national business practice in the EU and how they can overcome the obstacles that have arisen when there is a common currency but different national governments, with different political and social priorities. During the last 5 years, Greece has been in the middle of a dramatic financial crisis, with unemployment reaching 30% and a national debt of about 180% of GDP. The Greek economy has declined constantly over the last 5 years, yet there are businesses that manage to succeed not only within Greece, but also internationally in the global landscape. This course will investigate how Greek businesses manage under these conditions and will aim to give to the student ideas on how to overcome the turbulence from the external economic environment. The course will be taught through a case study approach. The course will explore the history of the Classical period (5th – 4th Century B.C. ), marked by the cultural and political dominance of Athens. The second half of the 5th Century B.C. has been called the “Golden Age” of Pericles. It will dip into the philosophy of Plato and Sophocles philosophy, and the early history of the Olympic games. The course will include a day trip to Olympia, a visit to the Olympic stadium remains and the Museum of Olympia, and also to the Panathenaikon (Kallimarmaro) Stadium, where the first Olympic Games in modern history were held. In Greek mythology, there is no single original text like the Christian Bibleor the Hindu. Instead, the earliest Greek myths were part of an oral tradition that began in the Bronze Age, and their plots and themes unfolded gradually in the written literature of the archaic and classical periods. Homer was the author of the first European literary classics, the Iliad and the Odyssey, written in the 8th-century BC. The course will discuss these works, which present the (mythical) Trojan War as a divine conflict as well as a human one. The course will also introduce the students the main aspects of the ancient Greek mythology including the Olympian Gods. Students will visit archaeological sites at Mycenae and Delphi. This two day hands-on workshop will teach you how to move from an idea inception to the first valuable requirements needed to build a minimum viable product. It is based on Lean Startup, Agile software development and UX (user experience) principles battle tested in startups and corporations across the world. It is aimed for business students with entrepreneurial spirit looking at technology oriented products and product design.